Digital painting tutorial Commander Shepard from Mass Effect video game series. Learn how to quickly paint a character in Photoshop video game conceptual art, commander Shepard from Mass Effect. 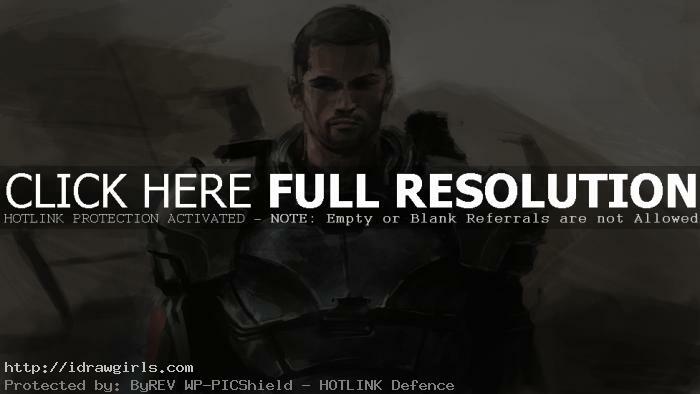 In this tutorial, you will learn how to paint commander Shepard with his armour from video tutorial and step by step. The tutorial is suitable for intermediate level, it is better if you already know how to use Photoshop to paint. Also you will need a tablet, I highly recommend Wacom intuo and cintiq tablet. They are widely used among professional concept artists. In this tutorial, I will show you a simple way to approach digital painting using lines then value. I spend about thirty minutes to complete this particular digital painting. This is one of the quickest ways to paint, I rely mostly on light and shadow to create shape and form for a character. Hopefully the tutorial will help you gain knowledge of shape, value and edges in painting. Shepard is the main protagonist of Mass Effect. Throughout the game, the player’s decisions can affect Shepard’s personality, consequently changing how both individuals and entire races view him/her and the human race. Key choices can even affect the outcomes of situations throughout the story. Shepard later becomes the first human to join the Spectres, an elite special task force for the Citadel Council. Shepard’s gender, appearance, history, combat-training and first name are determined by the player before the game begins. Shepard is 29 years old in the first game, and is biologically 29 or chronologically 31 years old in the second game. The default male Shepard, the model used by BioWare for trailers, is called John while the female default name is Jane; both defaults are of the Soldier class. Shepard is a veteran soldier who begins the game as a candidate to become the first human “Spectre” agent. As the game progresses, Shepard undertakes a series of important missions and is authorized to do whatever it takes to get the missions done. At the end of the game, Shepard kills villain Saren Arterius and helps defeat the Reaper Sovereign. Here is a final quick digital painting of male commander Shepard. Watch a painting video lesson, digital painting tutorial. How to paint male commander Shepard. Below are step by step images how to paint commander Shepard to supplement the painting video lesson. First, I start of with just line and try to make it as accurate as possible in proportion. Then I will start applying shape and value to complete the gray scale painting. Once I have the overall gray scale painting with basic value, then I can begin applying paint. Watch the video tutorial for in depth detail instruction on how to paint commander Shepard.